Jalpaiguri: Hundreds of tourists poured into the Gorumara National Park and elsewhere in the Dooars this Christmas, delighting resort owners. "Tourists have started arriving across the Dooars from all parts of Bengal and other states. In Lataguri, all the 50-odd resorts are booked till the first week of January," said a delighted Dibyendu Deb, secretary of the Lataguri Resort Owners' Welfare Association. Deb pointed that during the Puja holidays, many could not make it to the Dooars because of disruptions in trains as a portion of the tracks to north Bengal was washed away. "We expect to make up some of the losses." On Sunday, the second last weekend of the year that fell on Christmas Eve, hundreds swarmed the jungle safari ticket counter in Lataguri. Trips are usually conducted from 6am to 8am and from 2pm to 4pm. "We will allow two more trips, from 9am and 12pm," Bidyut Sarkar, divisional forest officer of Jalpaiguri, said. Visitors welcomed the move. "We did not get tickets for a safari but later, we got them for the additional trip. The forest department should allow more trips as people are arriving here every day," Shilpi Mukherjee, from Calcutta, said. 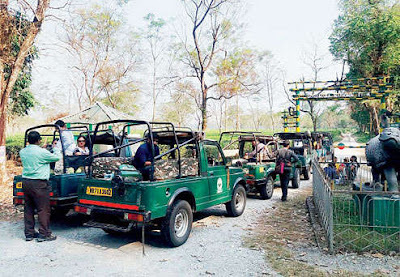 Hundreds of tourists poured into the Gorumara National Park and elsewhere in the Dooars this Christmas, delighting resort owners. "Tourists have started arriving across the Dooars from all parts of Bengal and other states.